The linhay has been beautifully restored and converted, using a combination of traditional and modem materials. 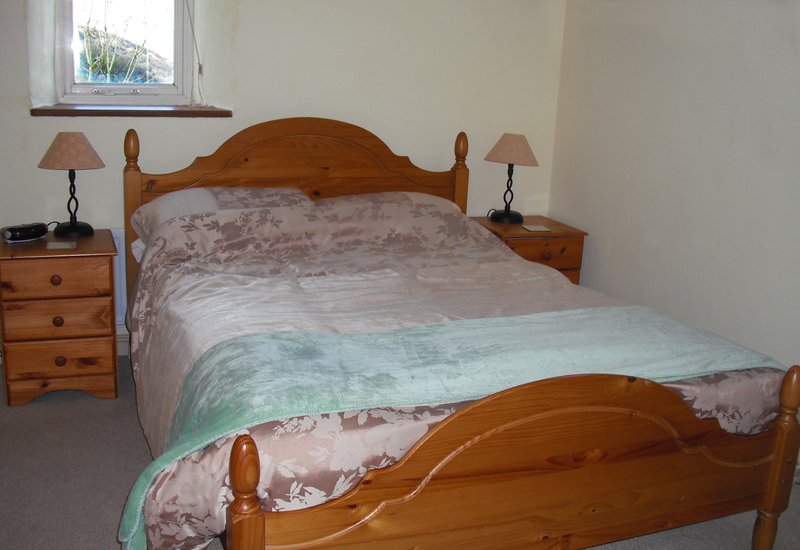 The result is a spacious, comfortable and warm home, with double-glazing throughout and central heating in every room. And for those who really like the warmth we have a modern log-burning stove and a free supply of logs. Outside there is ample parking and a large grassed enclosed garden, front and back, with a pretty fenced-off stream and waterfall. There is also a children's play area with swings and a slide. A barbecue and picnic table is supplied. The bedrooms, one double, one twin, have their own ensuite shower, wash-basin and WC. The fitted wardrobes and cupboards in each room provide ample storage space, and the windows give superb views over the surrounding countryside. Walk the farm trail designed by the Devon Wildlife Trust. Combe Martin, llfracombe, Barnstaple and Bideford. Surf or swim at the famous beaches around Croyde Bay. Excellent riding and golf are available locally. Take a trip to the island nature reserve of Lundy. to a large area of ancient woodland. indicate a freedom from air pollution. wildlife and the natural environment. 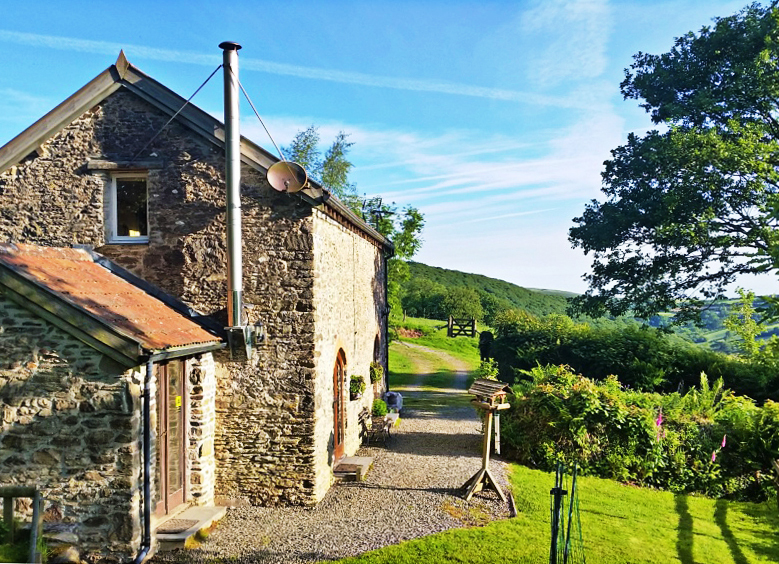 This really is a lovely base for exploring Exmoor and the spectacular North Devon coast. 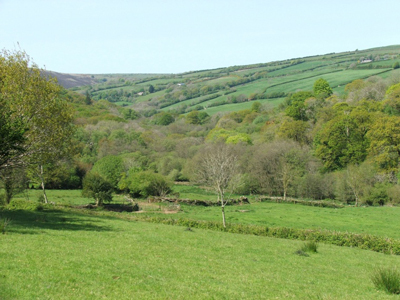 The scenery around Hollacombe Farm is magnificent and varied: You can enjoy fine prospects of the steep pastures and high moorland of Exmoor, before plunging down, beside the ancient woodland of Cowley Wood, into the secluded valley that forms the eastern part of the farm. Dogs. Dogs are welcome at certain times of the year. Please see the Terms and Conditions below for more information. 10 miles northeast of Barnstaple. 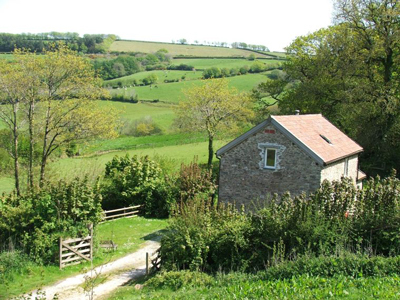 For the availability and price of your holiday please follow this link to our page on the Devon Farms Website. The price is all-inclusive, covering bedding, towels, gas, logs, electricity and the wi-fi connection. 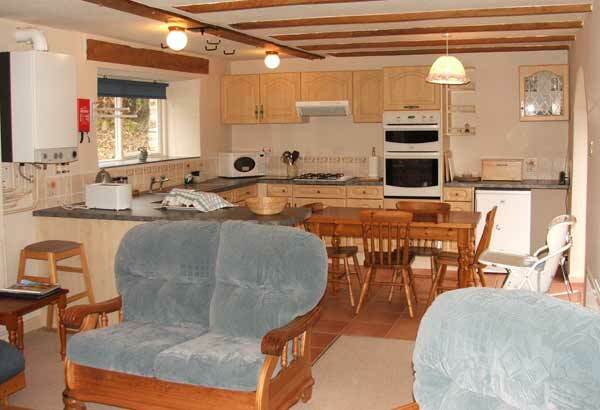 We welcome short breaks (min 3 nights) out of season. above or you can call or e-mail. Dogs We regret because of our Spring lambing pattern we can only accept dogs from 1 September to 1 April, subject to agreement at the time of booking. Dogs are charged at the rate of £20 per dog per week, payable with the final balance. Dogs must be kept under control at all times and kept on a lead when in the vicinity of livestock. 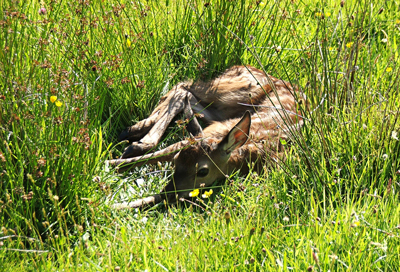 To avoid the possibility of damage being caused, dogs should not be left on their own in the linhay. Dogs must not be allowed on the furniture or up the stairs. If necessary the safety gate at the foot of the stairs should be used to prevent access upstairs. Owners should bring sufficient towels to ensure their dog(s) are kept clean and dry when in the linhay. The towels provided by Celia and Martin are NOT to be used on dogs. Damage/Additional Cleaning The costs of any additional cleaning or repairing any damage caused by their pets will be charged to the guests. A deposit of £50, payable with the final balance, will be used in the first instance to cover the cost of repairs or the additional cleaning. Any remaining money will be returned after the guests have departed. We naturally hope and expect that this deposit will be able to be returned in full after every booking. To allow time for the accommodation to be prepared for incoming visitors, we ask you to vacate by 10.30am on the morning of your departure; incoming guests are not expected to arrive before 4.00pm. In the event of a cancellation, the 20% deposit is non-refundable but we will do our best to offer you another available date. Taking out cancellation insurance is advisable to cover any eventuality. We cannot accept liability for any loss, injury or damage which may occur to guests or their property while they are staying at Hollacombe Farm. Visitors are responsible for keeping the cottage and its contents in the condition in which it was found, and reporting any damage. We reserve the right to enter the property if necessary during your stay.